You'll be £25.00 closer to your next £10.00 credit when you purchase Racing Ace. What's this? Order within the next 8 hours, 21 minutes to get your order processed the next working day! Samuel 'Kink' Kinkead won two DSCs with the Royal Naval Air Service, two DFC with the fledgling RAF and the DSO in Russia. A brilliant pilot, post-war he was a long range aviation pioneer and leading racing ace selected for the international Schneider Trophy in Venice in 1927. Tragically he was killed aged just 31 in 1928 attempting to shatter the World Air Speed record. He is honoured by several memorials, at Cranwell, the RAF Club in Piccadilly, at Fawley and a permanent exhibition in the Kinkead Room at Calshot from where he set out on his final flight. Julian Lewis has pieced together Kink's extraordinary story of achievement during his short but eventful and glamorous life. A fascinating account of flying derring-do in war and peace. Speaking of the human aspect of the great War, Racing Ace is all about one of the great characters of World War One. It would appeal to anyone who loves a well written book about a fascinating man, and in an ever-more cynical age, the example of Kinkead’s courage deserved the widest possible audience, for heroism and courage are as important now as they were then. Highly recommended. His research has been impeccable and amazingly comprehensive. Read it! You won't be disappointed. 'This is a masterly exposition of storytelling, Julian Lewis's detective story is worth a book in its own right. 'Julian Lewis's book brings Kinkead alive and reveals facts about early aviation that have for too long been kept in dusty archives. An outstandingly well-researched and many-faceted biography in which the author has skilfully interwoven the event's of his heroes life with contemporary political, social, and technical developments, and for example his narrative of the obscure events in southern Russia is as fascinating as his exposition of the terrifying difficulties of handling temperamental seaplanes. Pen & Sword have complemented his text with evocative photographs and decent maps. A remarkable story of a remarkable man, in the tradition of a rattling good yarn, and most warmly recommended. Excellent, An extensive bibliography lists both sources and recommendations for further readers, and the Index is of exemplary construction. Anyone with an interest in early aviation, anyone who can appreciate proper research, anyone with an imagination cannot fail to get something out of this book. A very complete account of an outstanding airman's flying life, and three-eight-page sections of well produced photographs, useful appendices and a comprehensive index complete an absorbing book. Julian Lewis has worked wonders in exhaustively plundering archive and resource to plug a gap in our aeronautical history. An interesting book about a remote and under-researched period an also about a lovely man. The Western Front has given rise to numerous stories of heroism, gallantry and struggle however this story deserves to be singled out. Racing Ace is the tale of Samuel Kinkead, receiver of six decorations for gallantry as a fighter Ace not only on the Western Front but also in the Russian Civil War. Narratively the book switches from Kink's action based adventures to contemporary debates on strategy and policy at the highest level in the armed forces. Through engrossing prose accompanied by intriguing maps and images, the tale of the flying ace Kinkead is revealed through chapters dealing with his presence in Iraq, Cairo and ultimately his tragic death in Spitfire witnessed by the people he fought to save. Julian Lewis' academic experience combines with the sixty five previously unseen photographs to create a book that is emotionally and educationally gripping. 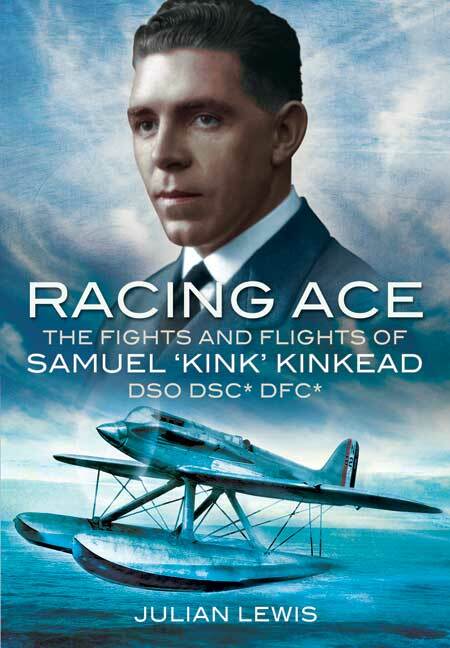 Racing Ace tells the true story of Samuel Kinkead, nicknamed Kink, who was a decorated fighter pilot on the Western Front, in the Russian Civil War, the Aegean in 1916 and Iraq in the early 1920s. He was also later on an award winning pilot for high speed flights, but this was his ultimate downfall as he was killed in 1928 at the age of 31 trying to break the 300 mph barrier. This book with 65 photographs gives us an insight into a man who not only was a skilled pilot in battle or competition but also took part in debates on strategy and policies in the Armed Forces, Parliament and the Government. An extraordinary biopic of an extraordinary, larger-than-life man. Thoroughly readable. This man could almost have been one of the inspirations for Biggles, but you have to remind yourself that nearly a hundred years ago, such men were pushing the boundaries of air speed and safety beyond practical limits. A daredevil, an inspiration, and a legend. Stirring stuff. As the author of Schneider Trophy to Spitfire, I had the occasion to to be in contact with Dr. Lewis and was impressed by the careful research that appeared to be going into his book. Having now read it, I am not disappointed and admire the amount of information he has gathered about a very self-effacing pilot who (unlike most Schneider Trophy pilots) has left no written records behind. Julian Lewis has admirably unearthed the details of how "Kink" won his impressive number of gallantry decorations and comprehensively shown what an outstanding RAF officer he was. Whilst it will probably remain a mystery as to exactly how he came to die in the S-5 record attempt, our author has supplied the fullest information from contemporary sources but has (wisely, I think) allowed the reader to draw his own conclusions. Kinkhead's story has been waiting to be told and Lewis has not let him down. Full marks. Samuel ‘‘Kink’’ Kinkead was an astonishing British Empire hero, and in Julian Lewis he has found the ideal biographer who combines a complete mastery of the sources with a novelist’s observational eye. Kinkead died as he lived, with preternatural courage attempting to extend the bounds of human achievement. At long last, he has a biography worthy of his extraordinary endeavour. Julian Lewis has brought back to life the quiet-man-of-the-air, ‘‘Kink’’ Kinkead – an extraordinary figure whose short life spanned service in the Great War, the Allied expedition against the nascent Soviet Union and 1920s Iraq, before ending tragically in pursuit of the World Air Speed Record. This is a fine piece of historical detective work. In this splendid book, Julian Lewis gets into the mind-set of a modest young South African airman – six times decorated for gallantry in battle – who was happy to risk his life repeatedly for causes he thought just, and for an Empire he thought worth serving. The best biographies are thoroughly contextual and this one is no exception. The narrative is rich in observation and explanation, yet still enticingly easy to read. Its subject comes across as someone quite remarkable for his sustained, adaptive, yet utterly self-effacing courage. A brilliant book, full of humanity . . . A glittering triumph of well-researched scholarship, first-rate writing, and a powerful conviction of integrity, dedication, courage and patriotism. Just finished the above book and although the period, WW1 and the inter war years is not my usual area of interest, I can say that it is written in such a way that it is most enjoyable to read, well researched, fast moving and the reader wanting to know what 'Kink' will achieve next. As for 'Kink' Kinkead, he was a quite remarkable man, leaning his flying combat skills in the Dardanelles and honing them on the Western Front before moving on to Russia where he earned his DSO. In 1928, as a member of the RAF Schneider Trophy team, Kinkead was killed in a crash aged 31 as he attempted to break the world air speed record in a Supermarine S5 the forerunner of the Spitfire. Leaves one wondering what this remarkable aviator would have achieved with WW2 looming, had he lived. A book I would recommend to all those who have an interest in aviation history. Julian Lewis has painstakingly researched and pieced together Kinkead's extraordinary story and has compiled a fascinating account of aviation derring-do in war & peace.